Today's enterprises need a faster way to get to business insights. That means broader access to high-value analytics data to support a wide array of use cases. Moving data repositories to the cloud is a natural step. Companies need to create a modern, scalable infrastructure for that data. At the same time, controls must be in place to safeguard data privacy and comply with regulatory requirements. In this webinar, Zaloni will share its experience and best practices for creating flexible, responsive, and cost-effective data lakes for advanced analytics that leverage Amazon Web Services (AWS). Zaloni’s reference solution architecture for a data lake on AWS is governed, scalable, and incorporates the self-service Zaloni Data Platform (ZDP). - Create a flexible and responsive data platform at minimal operational cost. - Use a self-service data catalog to identify enterprise-wide actionable insights. - Empower your users to immediately discover and provision the data they need. We all know that data is the lifeblood of a modern enterprise. But how can your business users action relevant, quality data into their applications for immediate value? The answer used to be “Build a data catalog”. Data catalogs have grown in popularity as an essential tool for understanding where your data exists and what it is. But, that’s only the first step – and an easy step at that! The harder part is giving your business users self-service access to understand THEIR catalog and enrich the data THEY need when THEY need it … and then allowing them to action it into their analytical or operational applications for rapid insights. Organizations that put analytics and artificial intelligence (AI) at the core of their transformation strategy will survive and thrive in the age of digital disruption. To achieve this, a holistic, modern data architecture and a rock-solid information supply chain are critical for success. 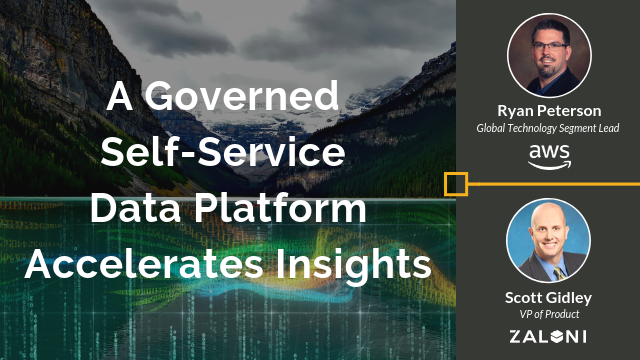 Organizations can deliver timely, self-service, democratized data access and analytical insights at enterprise scale by leveraging the innovation design principles of data lakes, scalable and elastic cloud infrastructures, and automated information pipelines. However, many find that these architectures are complex to create, deploy and operate — often resulting in poor performance, unnecessary expense and underutilized assets for the do-it-yourselfers. Transitioning to such architectures from legacy paradigms carries additional difficulty and risk, especially in hybrid environments that can span multiple design patterns and cloud providers. In this webinar, Clark Bradley, Zaloni solutions engineer, and Alex Gurevich, DXC Technology’s Analytics chief technology officer for the Americas, will present solution designs and representative field-use cases for simplifying and accelerating adoption of a modern, digital data architecture. Achieving actionable insights from data is the goal of any organization. To help in this regard, data catalogs are being deployed to build an inventory of data assets that provides both business and IT users a way to discover, organize and describe enterprise data assets. This is a good first step that helps all types of users easily find relevant data to extract insights from. Increasingly, end users want to take the next step in provisioning or procuring this data into a sandbox or analytics environment for further use. Attend this session to see how organizations are looking to build actionable data catalogs via a data marketplace, that allow self-service access to data without sacrificing data governance and security policies. Analysts need timely access to enterprise data in order to stay competitive in today’s rapidly changing environment. Typically, business users need to request access through the IT department, which can be a waiting game, either because of technological roadblocks, governance restrictions or both. This adds more work, more process, and more frustration on both sides. Having the ability to find data sets, examine, update, and provision the data themselves allows business users to move quickly and frees IT to work on higher priority items. A modern data platform should provide a self-service data marketplace that gives right-sized governed access to data. The security permissions allow IT to define who needs access to the correct data at the appropriate stage of the data pipeline. This becomes quite complicated in regulated environments. Users should be able to search for data they have access to, explore and potentially update the metadata associated, and provision it into a sandbox when ready. How does your organization collaborate with data? Aligning data management tasks across any size organization can be a challenge. This can be attributed to a lack of transparent data access, lack of big data skills, or antiquated toolsets that do not enable shared metadata for clear lineage of the data. Regardless of the reason, the results are slow, rigid decision-making processes. While modernizing your data architecture for more agility can seem overwhelming, with an integrated platform that enhances collaboration, organizations can reap the benefits of quality data that is well understood. The data platform should provide users with the ability to fully understand all aspects of the data with a simple, unified user interface where the business and IT can define, transform and provision the data. All while providing right-sized governance for access, security and auditability. Join Clark Bradley, Solutions Engineer with Zaloni, as he tackles modernizing your data platform and explains how your organization can expand collaborative practices with the Zaloni Data Platform. - Why is a data catalog important? - What do I need to know about data quality? - How does self-service play a role in the data strategy? A majority of the data collected by organizations today is wasted. Whether through poor analytics, lack of resources, or because they have too much of it. So how can organizations turn this around and actually start utilizing their data for powerful results? More and more companies are taking their customer, product, patient, or other data and providing a 360-degree view using a governed and actionable data lake. By breaking down the silos associated with traditional data located in disjointed systems and databases, companies are finding new ways to improve loyalty programs, product development, marketing campaigns, and even find a new source of revenue from their data. Join Jatin Hansoty, Director of Solutions Architecture at Zaloni, as he dives into real-world use cases from several of the world’s top companies. Learn from their architecture and the results they achieved. As more organizations migrate to the cloud to take advantage of the cost efficiency, resiliency, scalability and flexibility that comes along with it; they’re finding the number of data processing options are staggering. Should they choose Spark over Presto? How about Redshift Spectrum over Athena? Each have their own unique capabilities and might not be suitable for every scenario. Choosing the correct one can have a direct impact on an organization's bottom line. Join Raj Rana, a Senior Solution Architect at Zaloni, as he discusses what it takes to successfully deploy the optimal AWS processing frameworks for a variety of situations. Data storage, data compute. Data ingestion. Metadata management. Governance. Visibility. Privacy. Transparency. These are just a few of the considerations you must plan for when modernizing your data platform with a data lake. It can be overwhelming, especially if you try to stitch specialized point products together yourself. Data lake implementations can get out of scope and out of control quickly. Building a data lake is easy. Architecting a successful data lake that is flexible enough to accept multiple data sources, volumes, and types all while being able to scale with your business is harder. Do it wrong and you've created a data swamp. Do it right and you turn data into the most valuable asset in your business. The introduction of the European Union’s (EU) General Data Protection Regulation (GDPR) mandates a paradigm change in the way organizations use personal data. Elastic Stack is a suite of products which can help with GDPR compliance visibility. X-Pack access control for securing data access, Elasticsearch for indexing data for searches, X-Pack monitoring & alerting for data access events and REST APIs to manage the end to end privacy process. The modern, data-rich enterprise demands access to data at a pace that has outclassed traditional data management platforms. Whether they are utilizing a cloud, hybrid, or on-prem solution, these organizations require capabilities that are vendor-neutral and often implemented with microservices to ensure an agile environment at scale. “Data is the new oil.” Just as we have to drill to get oil, we also need to mine data to get information out of it. Google, Facebook, Netflix and other titans of the digital era use data to build great products that touch every part of human life. Regardless of scale, building a managed data lake on AWS requires a robust and scalable technical architecture. They often use microservices during the build process. A microservice architecture is centered around building a suite of small services focused on business capabilities and are independently deployable. It uses lightweight protocols and run on its own processes, which makes a microservice architecture ideal for building decoupled, agile, and automatable data lake applications on AWS. The three V’s of big data (velocity, volume, variety) continue to grow. There are more data types than ever, arriving faster, in sizes that traditional storage can barely keep up with. This is where transitioning to the cloud makes sense. With its on-demand processing, storage scalability, and potential financial savings, the cloud is now a data-oriented organization’s dream. But what model is right for you? What challenges should you look out for? How do you migrate effectively? Join Zaloni’s Director of Professional Services and Support, Raj Nadipalli, as he answers these questions - diving into cloud-based data lake use cases, a cloud-based data lake architecture, and more. All roads lead to cloud: (almost) everyone knows that now. The benefits so outweigh the risks, that even the stodgiest enterprise architects now see the handwriting on the ceiling. While the rules are much different from the days of on-prem software, the reality is that smart cloud architects know their knowledge bar just went higher. How can you stay prepared? Check out this episode of Inside Analysis to hear host Eric Kavanagh interview several experts, including Parth Patel from Zaloni. As new data sources continue to emerge, companies need to create “golden” or master records to achieve a single version of truth, as well as enriched views of customer or product data for applications such as intelligent pricing, personalized marketing, smart alerts, customized recommendations, and more. By leveraging machine learning techniques in the data lake, you can integrate data silos and master your data for a fraction of the cost of a traditional master data management solution. Zaloni’s Data Master Extension uses a Spark-based machine learning engine to provide a unique solution for Customer or Product 360° initiatives at the scale of big data. See what an agile, scalable data lake looks like with the Zaloni Data Platform (ZDP). Register to watch this 10-minute demonstration of an end-to-end use case for data management, governance, and self-service data within the ZDP. - A defined use case for ingesting and transforming sales data of various types and sources. - The data's journey through the platform, including ingestion, applying metadata, developing workflows, and exposing the data catalog for self-service preparation. - How data is presented to end users and the features that they need to export the data for business analysis. Zaloni simplifies data management for transformative business insights. We work with pioneering enterprises to modernize their data architecture and operationalize their data lakes to incorporate data into everyday business practices. The Zaloni Data Platform (ZDP) provides total control throughout the data pipeline from ingestion to analytics, with comprehensive data management, governance and self-service data preparation capabilities for IT and business users. A leader in big data for more than a decade, Zaloni’s expertise is deep, spans multiple industries, and has proven invaluable to customers at many of the world’s top companies. We are proud to be recognized by CRN’s 2018 Big Data 100 list, Forbes top 20 big data companies to work for, and Red Herring’s Top 100 North America Award.